Because it’s too good NOT to do. Starting at age 7 I had a paper route in our New Jersey neighborhood. I started with just 10 customers, a small section of my brother’s paper route that had been passed down from brother to brother. I wasn’t really very good at the sales aspect of things and even though I got a few more of his customers every year, somehow my route didn’t really grow. Since then I have tried selling a variety of different things and I have learned time and time again that sales for sales sake is definitely NOT my forte. But sales for the sake of something that totally changed my life? My parenting? My relationship with others? My work? My pursuit of happiness? I think I at least owe it to myself and to all of you to give it a try. And really, though I could go on and on about the work of Carrie Contey and the power of her year-long Evolve program and the clarity of her direction and the support of the community and the instruction and tools around the very basic idea that before we can get or create what we want, we have to KNOW what we want, I’ll just send you to the page that will speak for itself. And having just done a one day workshop by her entitled, Your Best Year Yet, I encourage you to check out the blog post on this page entitled: 2014 IS YOURS! So, if you want to really rock the heck out of your 2014, personally and professionally, and if you want to figure out some ways to be a more connected, intentional person, parent, partner, and friend, and if you want to figure out exactly what it is you want to do with this life of yours, check it out. I guarantee you will be glad you did. A couple of weeks ago I received an advanced reader’s copy of Hands Free Mama by Rachel Macy Stafford. 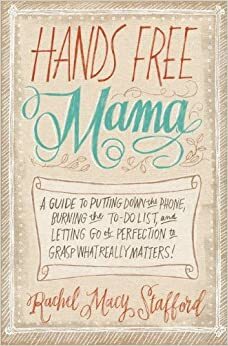 The tagline below the title reads: A guide to putting down the phone, burning the to-do list, and letting go of perfection to grasp what really matters. Needless to say I was immediately intrigued! Upon further reading what I found were super helpful ideas, reflections, inspirations and musings on slowing down, connecting more and understanding simple ways to do-over when you forget what you really want out of family life. Laid out like a beautiful series of meditations without being the slightest bit pompous, this book serves as a way to contemplate where you’ve been, where you are now and where you want to be. Like my own book, (hear that? Oh? What is it? It’s the sound of me tooting my own horn!) it offers ideas from the super practical to the more contemplative. It offers ideas for setting intentions about how you want things to go, and beautiful metaphors for living the connected family life we all know and want. This book isn’t suggesting you quit your job and go live on a mountain with your family, but it certainly offers some practical ideas for getting to that very feeling, even when you might be sitting in the middle of traffic. It’s a feeling. And it’s one we all benefit from. You can find the book at the usual places, and I highly recommend you do. 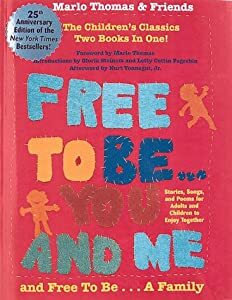 I’ve been reading “Free to Be You and Me” these past few weeks with my 6 year old. I found it on the shelves of my childhood home. It’s a great book originally published in 1974 by Marlo Thomas and friends. It’s got stories, artwork, songs, poetry and theatrical pieces all about life and the pursuit of happiness and being one’s most complete self. In the back there is an afterword by Kurt Vonnegut, Jr. It’s great information for kids and adults alike and especially for families who are trying to find ways to live the life they really want to live. “I’ve often thought there ought to be a manual to hand to little kids, telling them what kind of plante they’re on, why they don’t fall off it, how mcuh time they’ve probably got here, how to avoid poison ivy, and so on. I tried to write one once. It was called Welcome to Earth. But I got stuck on explaining why we don’t fall off the planet. Gravity is just a word. It doesn’t explain anything. If I could get past gravity, I’d tell them how we reproduce, how long we’ve beenhere, apparently, and a little bit about evolution. And one thing I would really like to tell them about is cultural relativity. I didn’t learn until I was in college about all the other cultures, and I should have leanred that in the first grade. A first grader should understand that his or her culture isn’t a rational invention; that there are thousands of other cultures and they all work pretty well; that all cultures function on faith rather than truth; that there are lots of alternatives to our own society. Cultural relativity is defensible and attractive. It’s also a source of hope. It means we don’t have to continue this way if we don’t like it.” Kurt Vonnegut, Jr.
As I read it I realized that what he’s saying is one of the tenets of Slow Family Living; that we don’t have to do it just one way. Kurt Vonnegut, Jr is right when he says, we don’t have to continue this way if it’s not working. There are so many ways that family life can work. Find the way that works for you. The way that brings you the most joy and lifelong connection possible.